When I was a kid, one of the things we did every autumn was to help rake up huge piles of leaves, and then run and jump in them. The younger children threw themselves into the piles, while the older ones turned leaf-pile jumping into a broad-jump type event. It was good, dirty fun that lasted until the leaves lost their loft and were hauled off to the compost pile. We didn't know it at the time, but all our jumping helped prepare the leaves for composting. When whole leaves are broken into smaller pieces, they leach out their tannins more readily than whole leaves, which transforms them into a suitable lunch for varying strains of fungi. These days I use a mower to coarsely shred my leaves, which I then use as winter mulch in the vegetable garden. Indeed, the mixture of chopped leaves and end-of-the-season grass clippings I can collect with my mower's bagging attachment is the best mulch I have found for covering newly planted beds of garlic. In the more wooded parts of my yard it is more practical to rake whole leaves into a bin for later use in compost or as mulch, and sometimes friends offer me plump bags of whole leaves. Setting up a temporary holding bin for composting leaves using stakes and plastic fencing takes about ten minutes, and some kind of enclosure is required to keep the leaves from blowing about. At first I make no attempt to moisten my gathered leaves, because dry leaves break into pieces more readily than wet ones. Thin leaves like those from dogwoods or poplars crumble like potato chips when they are dry, and thicker oak leaves crack into pieces. I stomp through the piles each time I add more leaves to crush them up a bit, and then wait for winter rains to gradually wet down the leaves. I am often asked about speeding up the leaf composting process by adding either fertilizer, as a nitrogen source, or a microbial compost starter. Neither are good ideas. Research on the biology of leaf decomposition has shown that the specific strains of fungi needed to start the rotting process are on the leaves before they fall from the trees. These fungi need only moisture and time to do their work, and might be set back by the introduction of alien microorganisms or chemical changes in their environment. Once you hoard a quantity of leaves and have them contained, you can let them sit there until you find a good use for them. By spring my collected leaves have begun to soften, but they are still in clumps that smell like rotting leaves. I often snake a soaker hose around the pile to provide moisture, but then proceed to use the half-rotted leaves as vegetable garden mulch as the need arises. Leaf mulch keeps the soil cool while blocking light to weeds, and several vegetables including bulb onions, pumpkins and potatoes have shown higher yields when their root zones are covered with a thick blanket of leaf mulch. Young fruit trees respond well to leaf mulch, too, by showing faster growth and better use of soil nutrients. If I were more patient I might make a batch of true leaf mould, which takes two years in my climate. An ideal substitute for peat moss, leaf mould does a great job of retaining moisture and suppressing diseases in potting soil mixes, and it dramatically lightens up soil when dug into a garden bed. I used to have lots of it, thanks to neighbors who dumped their leaves in the woods every fall and forgot about them -- after letting the neighborhood kids jump in the piles first. "i use leaves in all my beds in the fall flower n veggies to rot out, in the spring the plants have such life. As for the veggies patches i tile in the left over leaves as a compost." 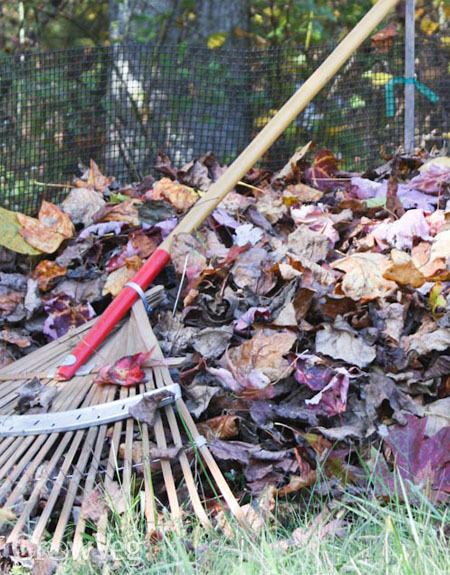 "I have purchased a leaf 'vacuum ' which is great at picking up the fallen leaves as well as chopping up the leaves as it picks them up. My concern is that it also picks up any seeds, nuts and of course fox poo that is hidden below the leaves. " "I used leaves as a soil builder and mulch this year with great success. Where I used the mulch there was no weeds, including Burmuda grass. Even had enough left over to make about 5 yards of grass clipping compost from chicken litter leaves. The only problem is we cut about 50 trees so this year so will have few trees. I giess I will have to beg for leaves destined for burn pile this year!" "to Tom..you know can also get your neighbors leaves as they put them in bags to be picked up by recycle, actually they will be more pleased to see someone use them... to Brian..I have a blower/vacuum too but i usually blow all the leaves in one pile and then vacuum it up so only the leaves are shredded I do have a question tho...are Elephant Ears leaves safe to put in your compost?" "Leaves of trees and plants are helpful to make compost fertilizer for farming. It is really a good concept to use leaves in vegetable garden. http://www.millsnutrients.co.uk/"
"I was wondering if the Poplar leaves would make the soil too acidic? " "I have leaves that have been in a pile all winter long and are not decomposed. Would it be ok to spread the leaves over what will be my potato bed, and till them under? I will plant my potato seeds in a couple of weeks. " "I have an allotment in SW London and in past years have grown potatoes in the conventional way. Lot of digging, then planting, then earthing up. Last winter the local council deposited about 70 sacks of leaves in our car park so am going to try planting potatoes about 2 inches down, cover them in the leaves to about 8 inches deep and top up as the season progresses. I am going to use pea/bean net pegged down on either side of the leaves to keep them from blowing away. Will report back in a few weeks!" "I Use bamboo leaves in my garden, is that ok??" "Kim If its just the leaves can't see that there will be a problem. If stripping the leaves off bamboo canes be extremely careful of the canes. Wear safety goggles. A plot holder on a nearby allotment in the same London Borough lost his eye recently when a cane went the wrong way. It only takes a moments distraction and "wham" "
"Hi, Can I til mulched leaves into my garden? " "Further to my entry on 25th April I have NOT proceeded with using leaves as a covering for growing potatoes. Reason? The leaves our local council left were collected from the gutters of roadways and probably contain all kinds of nasties, the worst being the products of car exhaust! I am for this year growing the potatoes under strong ground cover fabric and as Steve McQueen said in a scene from the Magnificent Seven, 'So far,so good'. I shall investigate collecting leaves from woodland for next year. Regards"
"I have a huge bamboo in my garden which I love but all of a sudden the leaves have been stripped now all I've got is canes. Whats happenedo it." "I have just started composting. I have several Elephant Ear plants and since their leaves are poisonous, I was wondering if it is safe to compost them. Thank you. " "I also have some clumping bamboo (Alphone Karr) that has lost its leaves. Is this normal after a few years, or should I be concerned about disease, etc.? That is, will new leaves be regenerated, or am I looking at removal? Thanks!" "I was informed from a gardener from Mona River Ndwedwe that he put leaves on all his vegetable plants and no he is enjoining the benefits. I just threw some on all my chilies as I cannot plant others due to monkey problems in our area . Is there any things that I can plant which they wont attack." "I note that some of my chilli fruits are looking good as per my farmer friend , he saw the leaves I threw around them." "Can leaves slow down the plant growing process in the first year? I use to have a nice garden every year but last fall I put leaves directly in the garden mixed them with the earth and now all my plants are turning yellow and not growing... I don't know what to do ... Can somebody give me an opinion, any suggestion? " "LEAVES ARE GREAT FOR VEG GARDENS,I FIND FOR MYSELF ,CRUSHING THEM UP WITH LAWN MOWER,AND ADDING RABBIT MANURE AND SOME COFFEE GRONDS IN A BLACK BAG.LEFTOVER WINTER WITH LOTS OF SMALL HOLES TURN THEM INTO QUICK COMPOST NOT ONLY THAT BUT LOTS OF WORMS CRAWL INTO BAG ,AFTER IT KOOLS , I LEAVE TILL SPRING,ABOUT APRIL HERE THEN LET MY TOMATOES GROW FOR 2 OR 3 WEEKS THEN ADD THEM WOW HUGE DIFF IN MY GARDEN NO WEEDS LOTSSSSSSS OF WORMS, THEY LOVE COFFEE GROUNDS AND REALLLYYYYYY LOVE RABBIT MANUR WHEN WET TU "
"Pile leaves on top of the garden - don't mix in. When you dig in the leaves, it ties up the nitrogen in the soil and will cause the yellowing of plants that was mentioned. When left on the surface, it provides a perfect habitat underneath for the earthworms and other decomposers to do their work, releasing the leaves nutrients slowly and creating luscious soil."